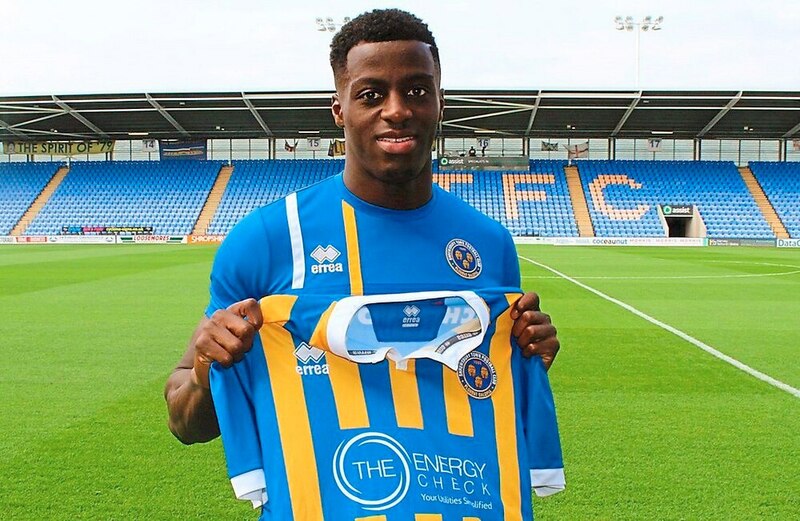 Josh Emmanuel’s Shrewsbury career is only 14 days old but the right-back does not feel he has stepped into a dressing room still in search of their first win. The on-loan Ipswich man was an impressive part of the side that caught the eye in out-playing unbeaten Portsmouth at Fratton Park last weekend. And he is expected to remain in the side as John Askey and his side hope it proves eighth time lucky against Southend tomorrow. Emmanuel, who played in the Rotherham team that beat Town at Wembley last season, was sent to Montgomery Waters Meadow to aid his development by Tractor Boys chief Paul Hurst. Shrewsbury are still winless in the league since the play-off semi-final second leg under Hurst, but Emmanuel insists you would not know it. “We’re not even worried about that,” he said confidently. “We’re grateful for the crowd here that will stay with us. Because at most clubs they wouldn’t to be honest. “It’s a well-structured club all round. We’re focused on getting the wins. “You only need to look at last week, Portsmouth are second and unbeaten and we should’ve won at their place. “We know what we need to do. We need to stick it in the back of the net. Emmanuel is aiming to build on the 38 appearances he made for the Millers during last season’s loan, the last of which came at he national stadium and ended in Salop heartbreak – an afternoon Emmanuel was keen to avoid during his first meeting with the Shropshire press. The powerful, attack-minded full-back, from London and formerly of the West Ham academy, admits he wants to blossom into an all-rounded player. “I definitely feel I came on there,” he added. “I can only thank the gaffer Paul Warne and the whole coaching staff there. It was a real good time for me there, but as I said I won’t talk too much about Wembley. Emmanuel will compete with James Bolton – now free of a hamstring injury and fully fit – and youngster Ryan Sears for a place in Askey’s first XI. Steve Arnold has also returned to fitness and should take his place on the bench tomorrow against Chris Powell’s Shrimpers, while winger Abo Eisa (knee) will remain sidelined for a couple of weeks. The Roots Hall club, in 16th, have stuttered so far this term with two wins and four defeats from seven but Askey values them as one of League One’s best sides. The Town boss said: “They’re a good team. They get goals, tend to play 4-4-2. Every game will be tough but Southend are one of the better teams in the league. "We've got to concentrate on ourself, dictate the game and come out on the right side." Chris Powell: "Shrewsbury were really unfancied last year but did brilliantly. They couldn’t get quite over the line in the play-offs and they also made the Checkatrade Trophy final so it was a wonderful year. "To emulate that is a tall order, equally with a new manager and after losing some players. They’re adapting to a new manager but it was a good result at Portsmouth last weekend. "They have a way of playing and it’s up to us to try and overcome that. I know the stats with regards to wins, draws and losses but you can never call League One. "It’s all about what happens on the day and we will need a sturdy away performance to win there because they’re starting to pick up." Nigel Jemson’s first-half effort and a rare Gregor Rioch goal after the break gave Town a Division Three win over the Shrimpers in November 2001. The onus is on the home team to go and get the goals. Winger Gilliead needs to produce some decisive moments in a Town shirt. The ex-Scunthorpe hot-shot was given the Shrimpers’ No.9 shirt after signing this summer and has started with four goals in seven games when his previous best for a season was nine. Described as ‘a nuisance’, the 24-year-old former Leicester trainee is not the strongest or quickest but loves a battle. Shrewsbury Town (4-3-3): Coleman; Emmanuel, Waterfall, Sadler (c), Beckles; Grant, Docherty, Norburn; Whalley, Angol, Gilliead. Subs: Arnold (gk), Haynes, Bolton, Barnett, Laurent, John-Lewis, Amadi-Holloway. Southend United (4-4-2): Stockdale; Demetriou, Turner, White, Coker; McLaughlin, Dieng, Mantom, Bunn; Hopper, Cox.